You can bet the mighty trumpet will bring the freaks out to the floor this Saturday night as Timmy Trumpet prepares to light up the stage at Marquee. Australia’s number one DJ returns to his hometown of Sydney for his birthday weekend after touring relentlessly across Asia, Europe and North America. 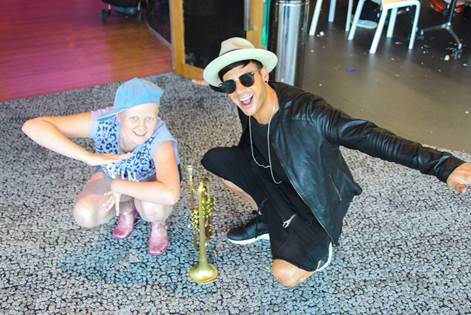 In a league of his own, Timmy Trumpet is one of the most unique electronic artists on the international circuit today. Yep – Timmy actually went to band camp! When the classically trained Jazz Musician Tim Smith AKA Trumpet graduated from the conservatorium of music, he was the last person that would have thought he would tour the world over as a headlining superstar DJ. In the last few years, he has toured more than thirty countries, playing sold out club shows and main-stage festivals in every corner of the globe. His phenomenal break-through single ‘Freaks’ with NZ artist Savage, smashed records becoming the highest selling single in Ministry of Sound Australia’s history, reaching five times platinum status in Australia. Peaking at #3 on the ARIA charts, #1 in NZ and hitting the Top 10 in numerous European destinations, the songs success had Timmy being welcomed at the airport by a barrage of fans in countries like Italy, Hungary and Ukraine. But anyone who has met Timmy, would understand just how grounded he has remained throughout every aspect of his career. While most would be swept away by a rollercoaster ride of limousines, VIP’s and five star hotels, he has dedicated his time to his trade working tirelessly with and for the better of others, in his industry and beyond. Join Marquee as we throw Australia’s favourite DJ a birthday party not to be forgotten! Playing all his biggest hits and much more, don’t miss out on Timmy Trumpet’s live performance this Saturday night. Tickets are on sale now!